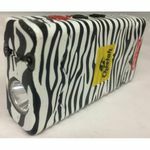 This Cheetah rechargeable is a great stun gun for any self protection purpose. The 10 million volt output is awesomely powerful and even a test fire will scare the daylights out of most attackers with any sense. 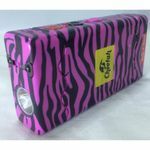 The Cheetah Stun gun is rechargeable, so there is no need to buy batteries. There is no power cord to lose since the wall plug prongs are built-in to the unit. It's self contained. Very compact in size, less than 4.25 inches tall and 2.25 inches wide, 1 inch deep. Also built-in is a safety switch. To operate, charge it up according to the directions included (16 hour initial charge, do not overcharge), turn the safety on (you will see the red led light up) and you are ready to press the round rubber button to fire. 2 Year Limited Lifetime Warranty to original purchaser. Its unique good looks will please you as will the black nylon holster with belt loop. 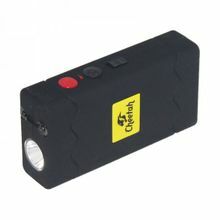 This is a top of the line rechargeable stun gun. This 10 Million volt models come in black and pink. Now also available is the CH50 in solid Black or Pink The CH50 models have a disable pin to render the stun gun void if taken from you. To use, you need to wrap the card around your wrist and insert the pin in the bottom of the stun gun. We do not ship stun guns or tasers to DC, NY, IN, HI, MA, MI, RI or outside the USA. Also we cannot ship stun guns to Chicago, IL.,Baltimore or Annapolis, MD.,Baltimore and Howard counties, MD.,Denison, IA.,D.C. and Philadelphia, PA. It's at least a misdemeanor and sometimes a felony to sell, possess or use a stun gun in these locales.